So now that I had all of these meatballs I needed to find things to do with them. Luckily, Giada didn’t let me down and I supplied several other recipes in ways that you could use these great turkey meatballs. The best part about all of them is that they con convert into really easy meals that only take a few minutes to create and you have something entirely new to enjoy for the night. 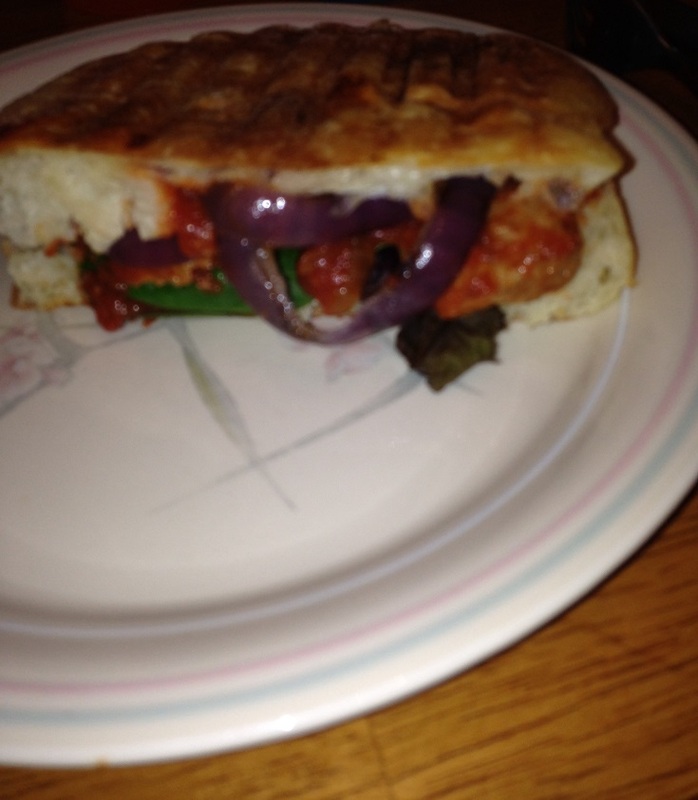 The first up was this really simple meatball panini recipe. 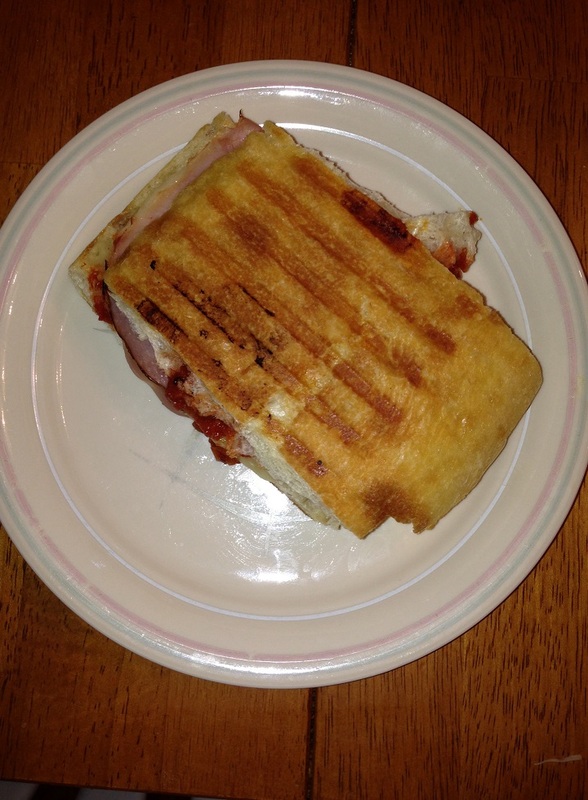 I have a panini maker, but you can just as easily do this with a grill, grill pan or skillet with a little bit of effort and it will come out great too. This recipe makes use of the meatballs and a few other simple ingredients to make awesome paninis for the family to enjoy. Pull out and remove some of he bread from the ciabatta rolls from each half of the rolls. This will give the meatballs a better place to sit in the sandwich. Spoon half of the tomato sauce over the bottom halves of each of the rolls. Sprinkle the sauce with red pepper flakes, if using. Add the arugula, the turkey meatballs, the prosciutto slices, grilled onions and the remaining sauce to each sandwich. Top each sandwich with two pieces of cheese. Add the tops of the rolls and drizzle the tops with olive oil. Using a pastry brush, brush the olive oil evenly over the tops of the rolls. Place the sandwiches in the panini maker and lower the press and cook until the cheese has melted and the meatballs are heated through, about 5 minutes. Alternatively, place the sandwiches on a grill pan or in a heated skillet and place a cast-iron pan or other heavy pot (anything heavy will really do) to press the sandwiches down and cook through until the cheese is melted and the meatballs are heated through. The great thing about paninis, or any sandwich really, is that you can put whatever you like best on them. If you don’t like provolone, use your favorite cheese on it instead or no cheese at all (which is how I eat it). If you don’t have prosciutto, use any type of ham that you like (which I did for Sean; I used Black Forest Ham). you can use any type of other toppings that you really like or use different meatballs and still get good results (those these meatballs are really good and you should try them out). I had mine with just the grilled onions, meatballs, red pepper flakes and arugula. Michelle had hers with the meatballs, arugula, grilled onions and provolone. 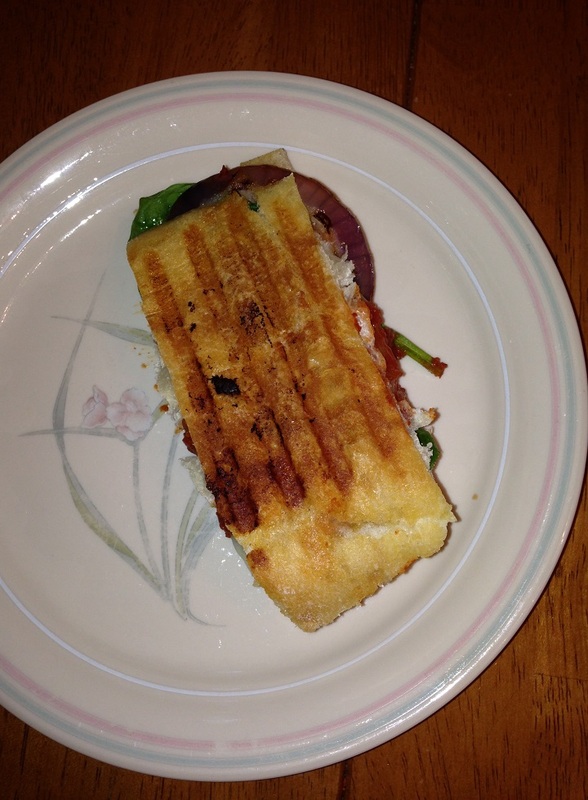 Sean had his with the meatballs, Black Forest Ham and prosciutto, no onions or arugula. They all looked really good and everyone really enjoyed the sandwiches. It was a great way to re-purpose some of the meatballs for a quick meal. Meatballs are one of those things that everyone seems to have their own way of making. Just like it is with meatloaf, meatballs can have just about anything in them and can be all types of meat combinations depending on your preferences. I have tried a bunch of different recipes in the past, including recipes from Giada di Laurentiis, who this particular recipe is from. Not that long ago an episode of her show features several meatball recipes, including the basic one for turkey meatballs that you start out with and then other recipes you can use the same meatballs for. I decided to start out the week with the basic class turkey meatball recipe and then build out from there. For the meatballs: In a large bowl, combine the breadcrumbs, Parmesan, basil, parsley, milk, ketchup if using, tomato paste, salt, pepper, eggs, garlic and onions. Using a wooden spoon, stir the ingredients until they are blended. Add the ground turkey and the turkey sausage meat. Using your fingers, gently mix all the ingredients until they are thoroughly combined. Using a 1-ounce cookie scoop or a small ice cream scoop, form the meat mixture into 1 1/2-inch balls (22 to 24 meatballs). Place the meatballs on a heavy nonstick baking sheet, spacing them apart. Drizzle the meatballs with olive oil and bake until the meatballs are cooked through, about 15 minutes. For the tomato sauce: Heat the olive oil in a large deep skillet with high sides or a Dutch oven over medium-high heat. Add the garlic, onions, salt and pepper. Cook the vegetables until they softened, about 5 to 6 minutes. Add 1/2 cup of the basil, the fennel, oregano and crushed tomatoes. Bring the sauce to a simmer. Cook the sauce over medium heat until the sauce thickens slightly, stirring occasionally, about 15 to 20 minutes. Stir in the remaining 1/4 cup of basil. Adjust the seasoning with more salt and pepper if desired. 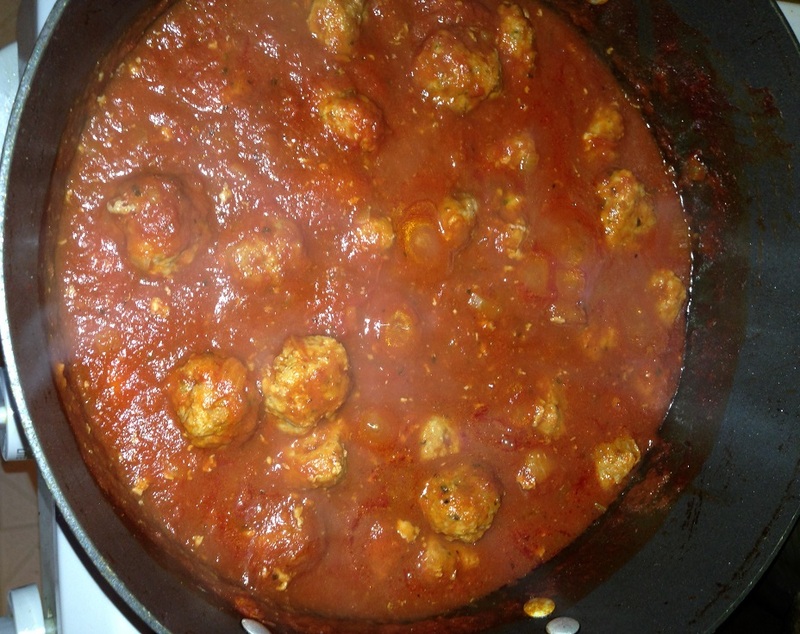 Add the meatballs to the tomato sauce and simmer until the meatballs are heated through, about 10 minutes. Thin the sauce with chicken stock, 1/4 cup at a time, if needed. Serve with grated Parmesan alongside. I have to say that of all the meatball recipes I have tried recently, I think this is the best one and since it uses only turkey meat, it might be the healthiest alternative of the ones I have made. The texture of the meatball is perfect and the flavor you get from the mix of the turkey meat and sausage along with the spices is just perfect. Throw it all in a simple sauce and you have a great meal. I actually doubled the recipe and made a lot of meatballs with this recipe to use for the other meatball recipes Giada tried on that episode, so I’ll be posting meatball options all week with what we had leftover. Of course, you can always just freeze some and use them when you want them. I left about half out of the sauce to use for some of the other recipes.